Like Buying Money...: NFL Week 15 - Cowboys & Redskins? Welcome to the good old US of American Football! NFL Week 15 - Cowboys & Redskins? Welcome to the good old US of American Football! The NFL keeps on rolling & we're really into the home stretch now with just 3 weeks of regular season games left before the playoffs, we're looking at two games between AFC North & NFC East teams that have big playoff implications with all 4 teams' chances in precarious positions. This game between the two best supported teams in the NFL has plenty of subtext to it & it's no surprise to see it's the televised evening game here in the UK, regardless of all the things surrounding this game we're struggling to see how the Steelers have been made favourites for the clash. There was tragedy before the Cowboys' game last week as practice squad member Jerry Brown Jr was killed in a car crash with team mate Josh Brent at the wheel, Brent was subsequently charged with manslaughter yet the Cowboys came up with a win over the Bengals with a last minute field goal. Dallas have hit a rich vein of form, winning 4 of their last 5 just when it looked like their season was a lost one with a 3&6 start & although they've not beaten good sides, the Bengals aside, it's been altogether better than Pittsburgh's recent run. The Steelers' recent poor run of one win in 4 has coincided with injury to their starting quarterback Ben Roethlisberger & even though he returned last week they fell to the San Diego Chargers who have been laughably poor for most of their season. Big Ben is clearly playing whilst still injured (he's wearing a Kevlar body protector) & whilst he is exceptional on the big occasions he may just be pushing it too much this time, it also doesn't help that their rushing attack really isn't good enough (ranks 25th in yards per game). Pittsburgh's offensive line has been a weak point for several years & that impacts on their running offense & also their pass protection of Roethlisberger & it's no surprise that he has been getting injured, that pass protection will be sorely tested by the Cowboy's star player & sack monster linebacker DeMarcus Ware who will be in the passer's face at every opportunity. Pittsburgh are still a force on defense, ranking 1st in yards given up & they'll be relying on that holding up here against Dallas's potent passing offense - it won't be easy even with the Cowboys' top receiver Dez Bryant having a fractured finger. Bryant's injury should mean that Tony Romo targets his good buddy Jason Witten even more & Miles Austin should see plenty of action too, the short passes to tight end Witten may do just the trick against the aggressive Steeler defense. 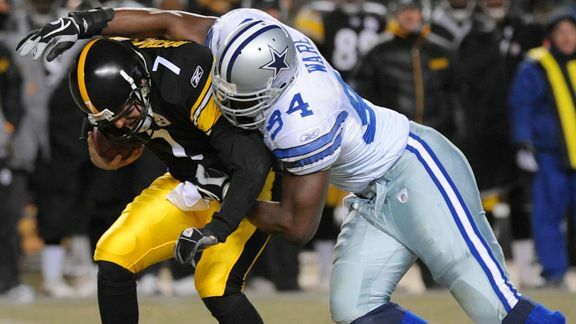 Dallas are renowned for being chokers when it gets to December & the playoffs loom but it's worth siding with them against the Steelers who have lost to some much poorer sides than the Cowboys, take the 11/10 on offer for a home win. In another game between sides from the AFC North & NFC East we see Washington travel to Cleveland to take on the Browns, the sides have won 7 in a row between them to improve from poor starts & this could be a good one. The Redskins have one big injury problem with their impressive rookie passer Robert Griffin III getting a knee injury last week & he is either out or going to play on the injured knee which will severely limit his mobility which is such a key facet of his game. the positive for the Redskins is that their backup quarterback, another rookie, Kirk Cousins did a great job when stepping into the game last week & they have the league's number one ranked rushing attack anyway. That run offense of course is helped by Griffin's ability to take off but their running back (another rookie!) Alfred Morris has been outstanding running for over 100 yards in 6 games this year including in his last 3 games. There should be points available whoever starts for Washington against the Browns' defense that is merely ordinary at best but they do need to improve on defense themselves, it's an area where they don't really have any stars & they are too reliant on 37 year old veteran London Fletcher at times. This game really is rookie central as the Browns' quarterback Brandon Weeden & starting tailback Trent Richardson are both first year players too, Richardson has undoubtedly been a success with 10 touchdowns although his yrads per carry is only average whilst Weeden has had his troubles at times. Weeden is actually the oldest player ever drafted in the first round of the NFL draft (he was 28 at the time but 29 now) & he previously played pro baseball, he's thrown 15 interceptions to 13 touchdowns but we think he should have done better with a nice set of receivers to aim for. Josh Gordon has been the Cleveland receiver to really step up to the mark in recent weeks & he'll like his chances of more receiving yards against the weak Redskin secondary. The Browns also have one of the league's best cornerbacks in Joe Haden who is basically a shutdown corenerback meaning he can completely nullify an opposing receiver - it may however not be overly useful in this one as we see Washington going very run heavy here. Even though both sides are on winning runs we can't be too impressed with Cleveland's wins that have come against Pittsburgh without Roethlisberger & then the hapless Raiders & Chiefs, they'll have a good go at it but Washington can pick up the win & keep themselves in playoff contention.